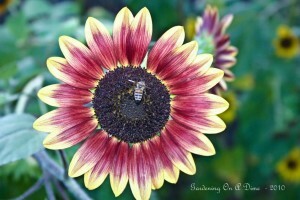 A few weeks ago we posted a note about our Autumn Beauty Sunflowers that were blooming. As you may recall, we found three varieties of sunflower seeds on clearance for a quarter a piece. 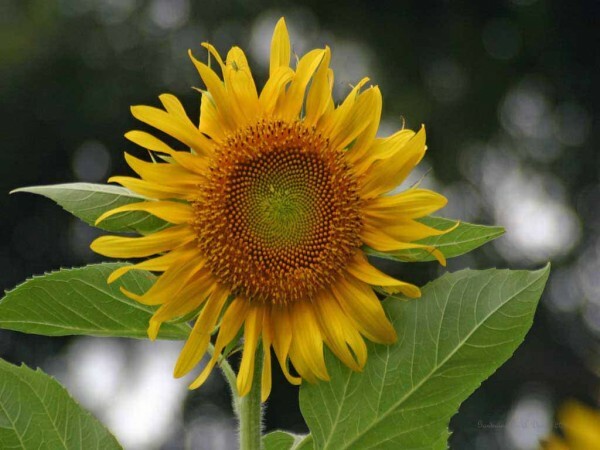 We bought one pack each of Russian Mammoth Sunflowers, Lemon Queen Sunflowers and the Autumn Beauty Sunflowers. 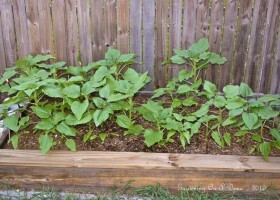 The seeds were planted into a raised bed that was constructed more out of necessity rather than design. Intentionally built this past May to hold an overflow of used potting mix and compost, we questioned if a four foot by six foot bed would hold all of the plants, assuming good germination. And only having a soil depth of six to seven inches, we wondered how these sunflowers would stand up in such a shallow bed. The potting mix for this garden came from cleaning out potted plants that didn’t make it through the winter, and last fall’s compost that was being stored in a bin that needed emptied to allow for a fresh load of spring potting soil. All of this planting material needed to go somewhere, so we constructed a small raised bed from a previous project’s leftover boards and screws. After we completed the bed and filled it with the recycled soil/compost mix, we decided to try to plant something. 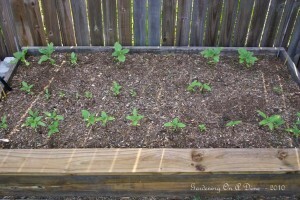 Having seventy-five cents worth of seeds in hand, a new raised bed and free soil mix, into the ground went the seeds. After that, we did little more than give them some drip irrigation for a few weeks in the dry spring. We never thinned them or tended to them. Bugs got to them the first few weeks of summer and chewed on them pretty good. We might have sprayed the young plants once or twice early on in the season with some “safe” spray. I say that we might have sprayed because, for the most part, we try to not spray any of our plants. Our yard is probably ninety- something percent organic. The occasional shot of roundup a few times a year to control those hard to maintain areas and some rose spray for black spot and bugs makes up the other small percentage. All things considered, they did quite well. 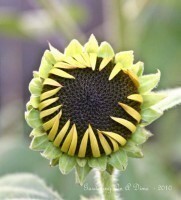 The remaining two varieties of sunflowers caught up with the Autumn Beauties and gave us just as much enjoyment. The Russian Mammoths rose to about nine feet tall. The flower heads grew to about a foot in diameter, with stalks about two inches thick. The Lemon Queen variety became a favorite. 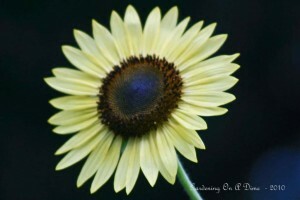 Only about six inch across, their bright yellow petals really stood out in the crowd. The iridescent blue centers only appeared at certain stages of development, usually as the bright yellow faded to a nice lemon color. 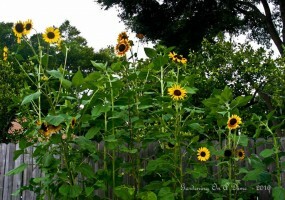 They grew to about seven or eight feet tall, with inch and a half stems. And, of course, the Autumn Beauties continued to bloom, even though they were the first to show their color. They grew just as tall as the Lemon Queens, with seven inch diameter flowers and similar size stems. All three varieties developed close to the seed packet description. The Mammoth Russians did not get quite as big of flower heads as advertised and both the Autumn Beauties and the Lemon Queens grew taller than expected. Those two also produced far more flowers than the Russian Mammoths. The Lemon Queen surpassed the other two varieties in numbers and longevity of flowers. It’s been a couple of weeks since these photos were taken. Now most of the flowers have faded and their heads are drooping down. It’s tempting to leave them stand. But, a fall bed filled with a cooler weather plant is calling us. Not bad for a DIY raised bed. We might cut the flower heads off and leave about a foot of stalk attached. However, instead of putting them into a paper bag to dry, as many folks do, these sunflowers might end up hanging over the top of the privacy fence for the fall and winter. And if we are fortunate, we will have birds flocking to our “natural” bird feeders. In closing, I want to pass a tip to you newer gardeners who are just getting your fingernails dirty. This is a very economical project that can be shared with everyone in your family. Kids, in particular, will enjoy helping plant the seeds and watching these plants grow taller and taller, towering over them. The ledge on the front of the bed makes a nice little spot for the young ones (and us older folks, as well) to sit and tend the garden during the plant’s early stages of growth. 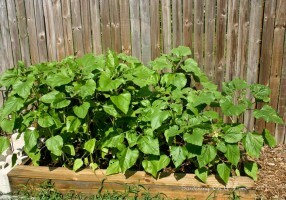 We wanted to prove to ourselves, once again, that gardening can be economical and enjoyable at the same time. 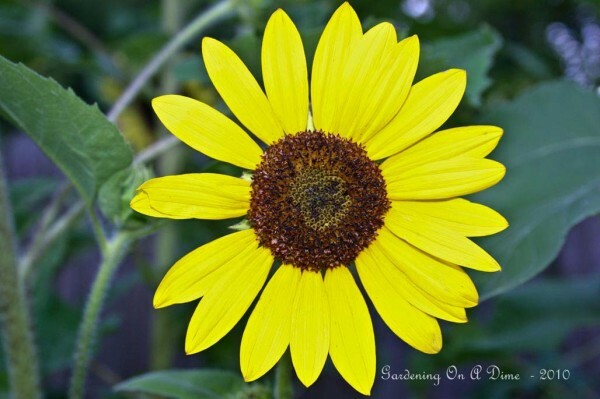 Being in the situation of needing to relocate some dirt, seeing extra lumber lying around and having a handful of seeds, we created another Gardening on a Dime project…… ooops…sorry…..in this case……..seventy-five cents. Don’t give up. You will find the variety that works for your area. Good Luck!